It's finally here. The (hopefully) final Battle for the Dawn is upon us; a fight between the living and the dead that has been building since the beginning of the series. Who will prevail? Will the end of the battle see a new day for the living, or will the Night King rule over the dead in a winter night that lasts forever? Call the Midwife follows the nurses, midwives and nuns from Nonnatus House, who visit the expectant mothers of Poplar, providing the poorest women with the best possible care. TURN: Washington's Spies is a Revolutionary War-era drama based on the Alexander Rose novel of the same name. The series goes beyond the battlefront to a conflict involving everyday men and women, taking place in a cryptic world of double agents, covert operations and code-breaking. It revolves around Abe Woodhull, a young farmer torn between loyalty to his Tory background and respect for those who fight for the patriot cause. Living on British-occupied Long Island, Abe joins a group of his childhood friends to form what becomes known as the Culper Ring, a spy network charged with sniffing out British military strategy. Under the direction of Gen. Washington, Abe and his fellow agents help turn the war to the Continentals' favor, and their daring efforts ultimately serve as the foundation for modern espionage. Upstart Crow is a satirical Blackadderesque sitcom about how friends, family, historical circumstances, and his arch-rival Robert Greene, who first coined the derogatory term "upstart crow", influenced William Shakespeare to write his famous plays. RMTV is a system where we can all watch a video together. Like a combination of Netflix and live TV, content comes to you streamed over the Internet, but it's a live feed, meaning we all see the same thing at the same time. Using the ShoutBox feature, we all get together and watch. When a show is scheduled, just go into the ShoutBox, and type, "/join #RMTV", without the quotes, and that will put you in the channel for discussing what's being played. Last edited by Diera on 12/22/18, edited 10 times in total. By request (and because the timing fits perfectly since we just finished Season 1 of The Crown) this coming Sunday I'll be playing the movie "The Queen", plus an episode of Chef after. Taboo's last episode will be held off until the 26th. On Dec. 3, we'll start relatively new with the start of Season 5 of Vikings, plus Season 1 of Versailles. The same people behind The Queen are who would later make The Crown for Netflix. The Crown isn't stated to be, but might be considered to be, a prequel for The Queen. It's been my opinion that one compliments the other nicely. Hence, my suggestion. I've seen bits and pieces of the movie and it looks fabulous. Due date for Call of the Midwife, season 7, is March 25th. I just read that Call the Midwife series 8 has started filming this morning! It returns with a new Christmas Special and series 8 in 2019. Awesome! The Crown is almost over, so when it's done, I'll throw Season 7 up. It's almost 8:00 and dinner's not even done cooking because I got home super late. I'm pretty sure I'm going to be running late tonight. A modern take on the Eight Legs? If so, our Doctor won't be well for the encounter. They did kill her once. Call the Midwife Christmas Special Exclusive: introducing our three new Nonnatun Sisters! “Our Christmas visit to the Order’s headquarters brings us three fantastic gifts - Sisters Mildred, Hilda and Frances. Elegant, scatty Hilda (Fenella Woolgar) and innocent Frances (Ella Bruccoleri) then move to Poplar at the start of the new series, whilst formidable Mildred (Miriam Margolyes) appears again in later episodes, keeping Nonnatus House on its toes! Nuns are the beating heart of Call The Midwife - they are wise, hardworking, compassionate, and combine the patience of angels with the faults and flaws of ordinary women. I have wanted to add more Sisters to the CTM family for some time, and am thrilled that the sensible lace ups of Mildred, Hilda and Frances have been filled by three such extraordinary actors. Each of them has already made me laugh, and made me cry, and I can’t wait to introduce them to our wonderful audience." It's official!! The brand new series 8 of Call the Midwife will premiere on BBC One on Sunday 13th January!!! Gillian Anderson is to follow in the footsteps of Meryl Streep, Patricia Hodge and Jennifer Saunders by taking on the role of Margaret Thatcher, it has been reported. Anderson, who is in rehearsals for a West End adaptation of the 1950 film All About Eve, will take on the role as the latest eye-catching addition to the cast of Netflix’s lavish blockbuster The Crown. According to the Sunday Times, she will reportedly appear as the former Conservative prime minister in series four of the show, with filming due to begin over the summer. Much will depend on her chemistry with Olivia Colman, who has succeeded Claire Foy as Elizabeth II for the next two series of the show. 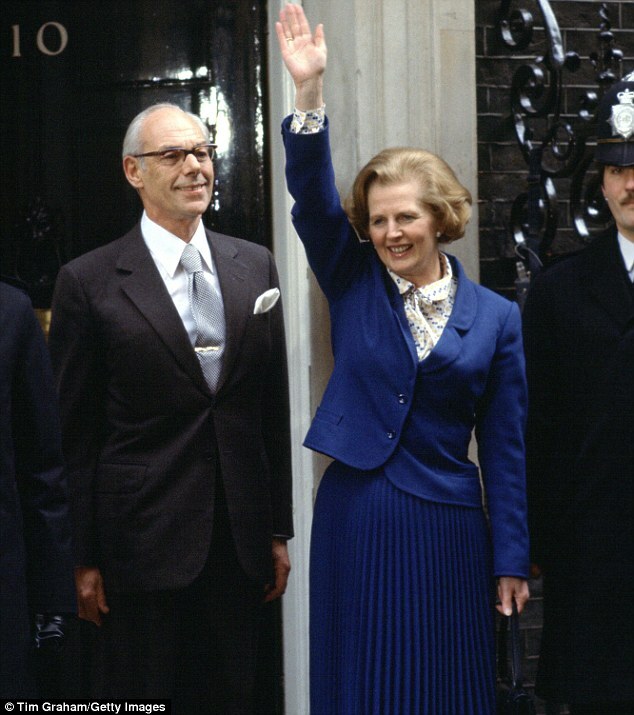 Found a picture of Thatcher from 1975. When she came into political prominence. I love Monica Joan so much. FANTASTIC NEWS!!! Call the Midwife has just been confirmed for three more seasons!! Just as Season 8 of Call the Midwife reached its finale in the UK, the BBC announced that Call the Midwife will continue for a further THREE seasons, including three new Christmas Specials! Call the Midwife has been one of Britain’s most popular drama series since it launched in 2012 and it continues to be the most watched drama series in the UK. Season eight has currently averaged nine million viewers per episode, making it BBC One’s biggest show of 2019 so far and the highest rating returning drama across all channels this year. With season 9 about to start filming, the drama will now be on air until 2022, and will depict Poplar life up until the year 1967. The critical and audience response to season 8 in the UK has been outstanding - the show has explored many areas of medical and social history, including the impact of disability, teenage pregnancy, Intersex representation, Sickle cell disease, mixed-race marriages, adoption, cot death and abortion.